At the time of this writing, Facebook has 1.32 billion-with-a-B daily users. That should give you a pretty good idea of why so many businesses are having amazing success with Facebook’s advertising platform. If you’re looking for a way to expand your reach and sell more of your product or service, Facebook should definitely be on your shortlist of advertising opportunities (and probably at the very top). Facebook advertising, while effective when done correctly, isn’t a “set and forget” method. It has to be done right, and throughout our experience we’ve seen small- and mid-sized businesses make the same mistakes time and time again. Today, we’ll be examining those mistakes so that you can avoid making them yourself. Let’s dive right in! The rapid growth of Facebook advertising is most likely the result of how deeply advertisers can target the platform’s users. At your fingertips, you not only have access to the largest social network in the world, you also have the ability to very specifically target users based on their location, age, gender, interests, behaviors, and much, much more. At their core, the most successful Facebook advertising campaigns are based on a foundational understanding of their target audiences. If you haven’t already, this is the perfect opportunity to begin really digging into your target audience—try to understand who they are, what they want, and how you can deliver it to them. Many businesses find success by building an “ideal customer profile,” which is an exercise in which you build an imaginary persona: the perfect customer. Who is he or she? What are their interests? How old are they? Are they married, do they have children? What are their biggest fears? Answering these questions (preferably backed by hard data whenever possible) will give you a strong starting point for your Facebook advertising campaign. This is the largest point on this list simply because some might argue that it’s the biggest mistake would-be Facebook advertisers make. In our experience, it usually is. A/B split testing is a relatively simple technique that can dramatically boost the performance of an advertising campaign on Facebook (or just about anywhere else for that matter). It’s so important that if you’re not split testing, you’re almost certainly losing money on your campaign. The basic concept is that you have two advertisements: “advertisement A” and “advertisement B,” each different from one another in some way. You run both advertisements and collect data on which one performs better. Once you have enough data, you toss the advertisement that didn’t perform so well and keep the better one. This, however, is not necessarily where A/B testing ends. Once you’ve tested the first pair of ads, you keep the “winner” and create another variation of the ad and begin split testing again. In theory, this process could continue on forever, but at some point most campaigns will reach a point of diminishing returns and the campaign manager can confidently say that the advertisement has been optimized enough. Until you reach that stage though, split test everything. A final but important note about A/B split testing: the advertisements don’t need to be completely different each time. In fact, they probably shouldn’t other than for the first few iterations of the advertisement. Some campaign managers prefer to begin by testing several sets of completely different ads. After a clear winner is determined from the initial bunch of unique ads, different variations of the “winner” ad are created. This could be a difference in the copywriting, colors used, images, and so on. Only one change at a time is tested, and often these changes appear to be quite minor. It’s amazing what kinds of small changes can have a big effect—sometimes simply changing the background color can dramatically increase conversions. Sometimes it’s so easy to get caught up in the Facebook aspect of an advertising campaign that the other components, such as your landing page, get neglected in the process. This is a fatal mistake—you spent time, effort, and money getting traffic to your website, but failed to engage the user at the most important part of the process. If you’re getting clicks to your landing page but can’t seem to get a positive ROI, it could be because you haven’t done any A/B split testing there either. That’s right, split testing on your landing page is just as important. Ideally, your landing page will have been developed by professional designers and copywriters and has been split tested. As entrepreneurs ourselves, we can understand how emotionally invested you can be in your business. “Everyone will like this!” you’ll think to yourself. And that’s not necessarily a bad thing, because the people who do love your product might become your most loyal customers. 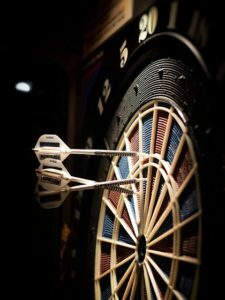 Regardless of whether you’re running a Facebook advertising campaign or a campaign on some other platform, a huge mistake many business owners make is targeting far too broad of an audience. Bottom line? Narrow down your audience—try somewhere in the range of 500,000 to 1.5 million people on Facebook—or even lower in some circumstances. There’s so many other moving parts to a Facebook advertising campaign that it’s easy to neglect one of the most important parts: the actual copywriting itself. It seems like such an obvious thing, but between image optimization, split testing, getting your landing page perfect… well, you can see how it might happen. Spend some time making your ad copy as concise, clear, and compelling as possible. Don’t be vague, but allow the reader to build enough curiosity to click. Pay special attention to your headline and call to action. Test, tweak, and optimize just as much as the rest of your campaign. 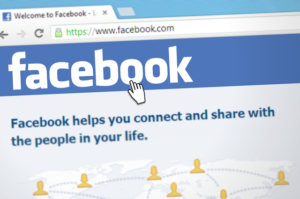 Did you know that you can exclude certain people from viewing your Facebook ads? For many businesses, one of the best groups to exclude are users who have already converted, meaning that they’ve clicked on your ad and performed whatever action it was that you wanted them to take. (This is especially true if the goal of your campaign was based around continued communication with the target, such as through an email marketing list). To make sure that you aren’t showing the same advertisement to people who have already done what you wanted, you can create a Custom Audience and use the Exclude feature. Usually, people are targeted if they’ve visited certain pages on your website. For example, you might not want to serve ads to people who have seen your “thank you for subscribing” page or your checkout page after making a sale. Before launching a campaign—and even after—keep a close eye on all the different components and make sure that everything works. A broken image here or an incorrect link there can spell disaster for a campaign, especially if you’re too “hands off” with it and leave it running, essentially throwing money away. Consider investing in an uptime monitoring service so you can be alerted within moments if your site goes down or if anything along the way breaks. It can and will happen eventually. 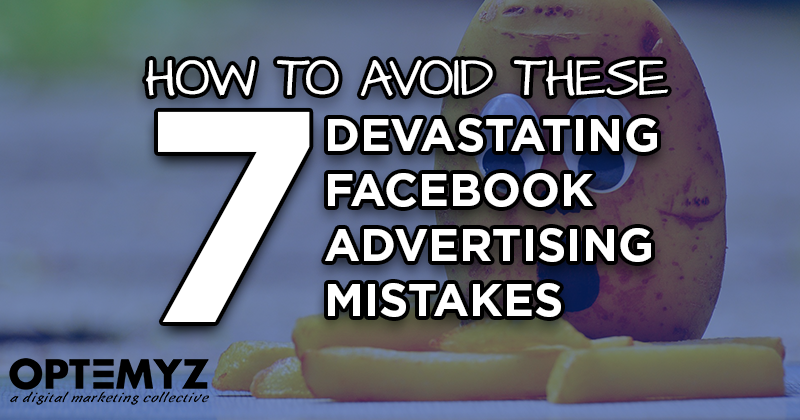 We hope that these seven Facebook advertising mistakes have shed some light on what you may need to rethink about your current advertising campaign. If you’re still struggling, or if you haven’t started tapping into the “goldmine” of Facebook advertising yet but you’d like to, we’d love to start a conversation with you. 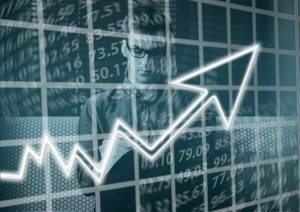 The team of marketing professionals at Optemyz can help you fix your current campaign so you can finally start seeing a positive ROI, or we can build you a winning campaign from scratch. Don’t be shy—reach out to us today. Previous Post: « Is This The Future of Your Marketing Strategy?